What is Local SEO and How to Optimize Local SEO Effectively? Running a local brick and mortar business is hard. You have to deal with everything an office/work-from-home business has to deal with, and you also have to deal with everything that comes with running a business with a physical presence. It’s like having double the work. Take SEO for example, not only do you have to do the “regular” SEO, you have a related subset of SEO tactics and strategy specifically for a local business. The reason is because no two search results are the same. In addition to constantly testing and improving what appears in the search engine results pages (or SERPs), search engines like Google also personalize the results of a search query for each specific user, based on their recent search history, demographic profile, and of course location. Take a look at the above screenshot. I created a demonstration search for “newborn photographers near me.” Since Google knows that I am in Chicago, they have personalized my results, showing photographers nearby. Google knows that this is a local business search, so it includes a rich data card with a map, and a list of local businesses. It will include additional metadata about each business; ratings and review count, address, hours, contact phone number, a link to the website and directions. These results are incredibly important for the success of local businesses. In fact, when I was optimizing Local SEO for the Big Three (General Motors, Ford, and Fiat/Chrysler), I determined that over 53% of automotive dealerships’ leads came from their Google Maps listing. For context, that is dramatically more leads than came from AdWords call ads, which we frequently spent over $30k/month on. Fortunately, Local SEO is also not very complicated to optimize for, however it does take a bit of diligence and initial elbow grease. A well organized marketer can easily create long-lasting results that will outperform their ad spend by multiples. In this guide, I will outline some of the specific and tactical steps a brick and mortar business can do to improve their results. This is the type of guide that local SEO agencies want to keep you from seeing. What are Online Directories? What are Local Citations? On-Site SEO: Often referred to as content marketing , this is the process of creating exceptional content that provides value for customers and helps to answer whatever questions they are asking the Google search bar. Content marketing should aim to solve the problem that your product or service solves, only through content instead. On-site SEO acts like your resume and demonstrates your credibility as a subject matter expert. Off-Site SEO: If on-site SEO is your resume, then off-site SEO are your letters of recommendation. Off-site SEO is the process of earning legitimate backlinks that point to your website and original content. Different websites have different values of “SEO juice.” For example, a single link from CNN.com to your website carries more weight than tens or perhaps hundreds of links from smaller sites. In fact, too many similar links from lesser known sites can actually hurt your results in the SERPs. This is a gross generalization. On-site SEO involves much more than just producing content, and also includes things like making sure your pages can and are indexed by the search engines, optimizing meta tags, making sure there are no errors, your site works on both desktop and mobile experiences and has lightning fast page speed. The primary differentiator between Local SEO and regular SEO is the inclusion of online directories. These are websites like Google Maps, Yelp, Foursquare and others that have taken over the service that your yellow pages used to provide. A good way to think about the bulk of the work you can do to optimize your Local SEO is a specific subset of Off-Site SEO that is focused on optimizing your listings in these online directories. The process of doing Local SEO is relatively straightforward. Find as many credible directories as you can and make sure you are listed in as many as possible, and that your information is consistent and up to date. Many directories have their own web scrapers, and will constantly check other directories to make sure their information is consistent and up to date for you. By verifying your profile as a business owner on a specific directory, you are letting the directory know that you are the business owner, and thus are a credible source of information about your business. This constant crawling and updating means that you need to be consistent with your information as you update it across the web. You don’t want one site to be pulling inaccurate and inconsistent information from another site, because this can create a spiral of self-updating by the directories that makes it harder and harder to keep clean. Google and other search engines will look at the consistency of your information across all the directories it comes across and will use that consistency as a signal for the legitimacy of your business. The more legitimate your business looks to Google, the higher your business is likely to rank in their search results. Specifically, you want to keep your name, address, phone number and site (referred to as your NAPS, more on this later) information consistent across all of the directories so that search engines are able to recognize each piece of information as related to the original business. I have put together a list of general online directories that you can use to get your brick and mortar listed. I have also included a sheet in the spreadsheet where you can pre-write some answers to some common form fields. Do this first. Spend some time getting the answers right. Unless you use one of the tools described below to keep your listings in sync, it can be a real challenge to go around to all of the specific directories and update them with changes. In addition to the longer list of directories in the specific file, I will cover the big four: Google, Yelp, Foursquare, and Facebook in greater detail below. Google has made a lot of changes for the better during my career as a Local SEO, and for good reason. “Google My Business” essentially serves as a lead magnet for their bread-and-butter AdWords and AdWords express platforms. While AdWords can be an excellent source of top-of-the-funnel leads for your business, you don’t need to invest in SEM ads to take advantage of the Google My Business platform. Once you submit your listing to Google My Business, Google will verify that you have a right to claim the listing by confirming that you are the business owner. Typically they will mail a unique code to the address you added to the listing, but occasionally they will just call the number you have on file as well. In my experience Google Maps is always one of the biggest drivers for leads for local business. In my agency days when we were doing call tracking, we measured 53% of all inbound phone calls originating from the Google Maps (what is now Google My Business) listing. That included monthly AdWords budgets of $30k or more. If you only submit your business to one listing, make it this one. Yelp… Well it is what it is. No other directory elicits such a visceral reaction from a business owner than Yelp does. Whether you love them or hate them, as a small business owner you have to deal with them. Claiming a business on the Yelp platform is free, so make sure to register your business on the platform, keeping all the information consistent across all of your directories to the best of your abilities. A lot of people shrugged off Foursquare when they split Swarm out into its own app, but Foursquare is not going away anytime soon. In a former position, I had access to hundreds of thousands of anonymous credit and debit card transactions for a subset of brick and mortar stores. Of all the data sets I analyzed, nothing had a stronger correlation with revenue for a given location than the Foursquare score. Part of the reason, we suspected, is because Foursquare calculates their score differently from the rest of the directories. Where the other directories are primarily based on reviews, Foursquare considers a variety of factors. These include number of check-ins as well as frequency of check-ins; we also suspected they had extensive partnerships with Beacon providers to count foot traffic. While the exact algorithm Foursquare uses is confidential, we saw a strong correlation with the ratio of total check-ins to the number of unique check-ins and a local business’ Foursquare score. Meaning the more a single customer checked in on average, the higher the Foursquare score. Whether a higher Foursquare score was a correlation or a causation of higher revenue is certainly up for debate. Still, I would advise making sure your business is listed and you encourage your customers to check-in. Chances are, if you run a business, you are already active with a Facebook page for your business, and Facebook has done a great job recently of providing the tools for marketers to advertise their businesses. Optimizing Facebook for a local business is easy, just make sure that you include accurate location information in your Facebook page details. This is true even if you are a local service business that travels to your customers location (cleaning service, lawn care, construction, etc.). Once you start to generate positive reviews (more on this later) you should make sure to optimize your page so that the “Reviews” tab is close to the top for everybody to see. NAPS is an acronym that stands for Name, Address, Phone, and Site. Directories are mostly made of structured data, like NAPS, but also include things like business categories, hours, description, keywords, products, menus, services, and more. NAPS are the four structured data fields that are most likely to appear in a directory, and so Google and other search engines place stronger influence on those fields. It is far easier for Google to use a phone number or a website — essentially a unique key just for you to identify your business as the source of the directory listing. However, I strongly discourage you from using any type of phone tracking number for each specific directory. You can use a call tracking system for call ads, but you should pick and use a single phone number to use for all of your directory listings. JSON-LD is a markup schema that you can use to include relevant information about your website inside the website tracking information. JSON-LD utilizes the schema.org markup for a page to help provide additional structured data to search engines, so they may in turn provide more contextualized information to search requests. Once you have your JSON-LD, you can simply paste it into your site. Make sure to include it on the homepage; I would also recommend including it on every other page on your site as well. If you are using a CMS like WordPress there are frequently plugins that make it possible to include a script or snippet in the head of your site. For more information on JSON-LD, Whitespark has an in-depth guide on their website. Many tools exist to make the process of managing directories easier. Some of them will constantly check for differences in the directory information and will update the directory automatically if the information changes. For that reason, tools can save you a lot of time over the course of a year, but are usually pricier. Tools can show you keyword research, directory information, let you white label SEO reports, or help you manage your online reviews. If you have some downtime it might not be worth the investment, but later as business starts to pick up it can have the best ROI compared to anything else you do. Other tools are closer to more traditional SEO tools. These will look at your competitors websites and build a list of all the directories and websites that you can be listed on. These tools require more manual work from you, but will expose more opportunities for you to list your business in more industry-specific and/or localized directories. Yext has been around for a long time, and recently went public, so expect their platform to only get better. They are a bit pricey, but will help notify you of new reviews so you can respond. Yext will list your business in more than 55 generic directories, and can advertise special offers through the directories as well. As directories have experimented with different monetization strategies, a few of the larger players have realized that they can squeeze out a few extra dollars by having business owners pay a fee to claim and verify their listing (MapQuest, Foursquare). Yext has many relationships with their specific directories, so you can forego these fees and substantially offset the cost of the service by working with Yext directly (rather than a DIY tool). Moz has been around for a long time, and is the market leader in the SEO software space. They have a vibrant community, and excellent content. Moz moved into the local game, when they purchased getlisted.org a few years ago. They will publish your content for you for $9 per directory per month. This means that for the $499 cost of the Yext Complete plan, you can afford to sync four directories per month. That doesn’t seem like a lot, but $499 can be a tough pill to swallow for a business up front. It’s all about the cash flow! Whitespark is a good option on its own, or in addition to any of the other platforms. Whitespark does an excellent job of searching for industry specific websites and directories for you to submit your information. For example, Whitespark will often return international tourist directories in their results. A recent audit I did for a friend’s business returned a greek tourist website recommending places to go in Chicago where I live. Yext will never include that in their listing sync. The downside is that it requires a lot of manual action to submit your business listing to all of the results that Whitespark provides. They offer a service to handle all of that for you, which is a good option if you are short on time but have the cash. BrightLocal is another option that has been on the market for a while. Like Whitespark, BrightLocal will search beyond just regular directories to display citation opportunities for you that are specific to your business or industry. Brightlocal is a bit more app-like than Whitespark, and starts at $29 per month and comes with a 14 day free trial. The paid plan will get you access to their complete suite of tools. If you don’t want to pay a monthly price, you can buy ad-hoc credits for their citation builder service. Many Local SEOs (people that do Local SEO for a living) believe there is a strong correlation to your online reputation and how well your business will show up in the SERPs. 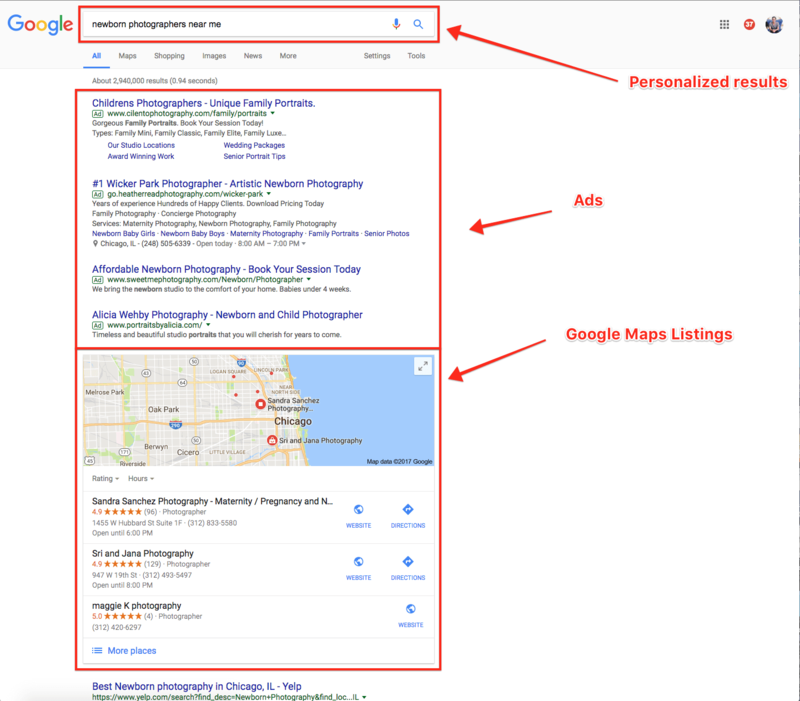 Additionally, local business ratings can appear in search results, and have had a demonstrable effect on the CTR (click through rate) of the result in the SERPs. The best way to drive new reviews is to ask for them. However, it wouldn’t be prudent to request reviews from contacts that you know are unhappy. It is also generally a good idea to take the pulse of your customers so that you can understand how happy they are with your product or service. Proactively reach out to your customers and ask how their experience was. No matter what industry your business is in, it is also in the hospitality business. Driving positive reviews is really a simple process, made even simpler through ActiveCampaign’s automation feature. Then in your email template include list of links with the numbers zero to ten on them. If a contact clicks on links 8, 9, and 10, drive them to a page letting them know that you received their feedback and thanking them for taking the time. Design the page asking them to complete their review of your business on one of the public directories you have optimized in the earlier section (Google My Business, Yelp, Etc…). If the contact clicks on links 1 through 7, have those links drive the contact to a different page on your website, asking them for additional feedback about what you could have done to improve the experience. You can use an ActiveCampaign form for this with a custom form field. See below for ways to enhance this for future interactions with your contacts. Make sure to follow-up again once the contact has submitted the detailed information about how they feel their experience could have been improved from their most recent visit. In all my experience working in this way, the best results have always come from the companies that genuinely care about correcting any mistakes that customers have had visiting their stores, and who actively make an effort to incorporate customer feedback into their business model to hold staff accountable and provide a stellar customer experience. You can optimize and streamline relationships with your customers so that you can manage those relationships at scale. You can NOT trick search engine algorithms to highlighting a business that shouldn’t be highlighted. Remember, it is best to think about Google as a team of thousands of the best engineers in the world, not some simple algorithm you can outsmart. Beware of any agency suggesting that they can guarantee a significant number of positive reviews, this can cause more harm than good.